I do a show every Saturday call Ask the Podcast Coach with Jim Collison from theaverageguy.tv and at one point I decided to connect with Jim over Google hangouts, as well as have a Call In Number for the phone. I had to send a mix to Jim that had myself and the caller (but not Jim) while sending a mix to the caller than had myself and Jim (but not the caller). For those up on the lingo, I had to configure two mix minuses. I needed a mixer with two auxiliary outs. I found the Behringer X1832. It did the job well. I had a ton of extra channels, and effects that I never used. Then we switched and instead of using a phone (using CallinStudio.com) we went to a chat window to take questions. This was simple and free (using chatwing.com). So now I have a giant mixer taking up half my desk, and I was looking for an alternative. I have a Yamaha MG102c Mixer (which has been replaced by the MG10XU) that would do the job. For whatever reason, I just didn't like it. It seemed like I had to crank everything up to the max. It still had a clean sound, but it seemed like I really had to push everything. I realize this is stupid (cause you should vote with your ears, not your eyes) but I've been hesitant to go back to it. I use a Zoom H5. A great device with a giant screen. However, due to the way the studio is setup with the majority of the light coming in from Behind the Zoom H5 I cant' really get a clear reading. While there are lights to let me know when things are peaking, I tend to feel those are too sensitive. Then I heard about the Sound Devices MixPre-3. This might solve all my problems. I want to plug in my iPad to play sound effects. WOW IS THIS THING SMALL. I have an iPhone 6s, and it might be an inch wider, but it is the size of an iPhone on steroids. VERY COOL. At first, I was worried about the touch screen display. But the display is super clear, and you can adjust the brightness. I had no problems reading it. I was worried about the touch screen is small. That didn't seem to be an issue (I'm a guitar player with long fingers and not very fat). I almost didn't need the manual. I plugged in a microphone, hit record and was up and running. Using it as an Interface – WHY AM I DRUNK? I went into Hindenburg Journalist and did a recording. it was nice and clear, but I sounded slightly drunk as my voice was lower (as if the sound had been slowed down). I launched Adobe Audition and got the same issue. Hmmm. As I'm on a PC, I right clicked on the Speaker in the bottom right-hand corner of my screen and went to the Properties of the Mix Pre-3. I had to set the recording and playback to 2 channel 24 bit, 48K. This solved the issue, and everything sounded fine. How Do I Setup a Mix Minus? 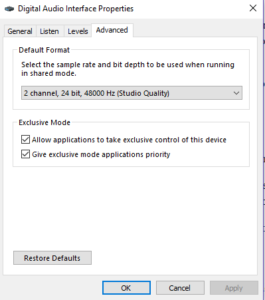 I was able to set the input of Channel 2 to USB-1, and I could now hear my Skype caller. I was on Channel 3, and life was good. How do I go about making sure that the sound of the caller does not go back to the caller? 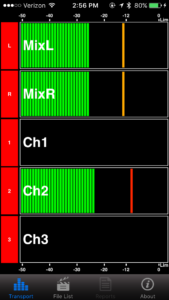 I look at the output, and all the output routing is for the stereo out mix. Where do I adjust what goes back to the caller? I looked, and looked, and headed to YouTube. 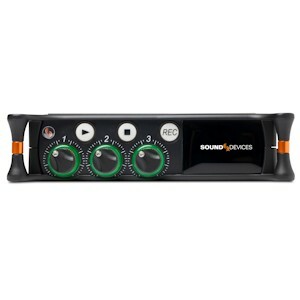 They have a video on the Sound Devices website, but they just said, “Set the input and out to the MixPre-3. My thought was, Yeah, but then what. Finally, I saw a video that explained you can't route what is going back to the USB output, and that you don't need to setup a mix minus, as IT JUST DOES IT. Well, that's cool. I'm definitely stopping by their booth at Podcast Movement and asking some questions about this as (and this is important) I'm not sure I'm 100% right on that. If I wanted to use the Stereo Output jack into another USB device (in my case I use a Griffin imic) than I could get into more advanced setups. What Would I Fix About it? The On/Off switch is placed in a not so great spot, but then again because this thing is so tiny, any place you put the switch it's going to be right on top of something. It seems like having the SD card behind the battery pack is a bad idea. However, when I push a button and turn on file transfer, it was super fast to copy the files from the device to my computer. I originally was somewhat bummed that it doesn't have a “Marker” feature, but using the wingman app (free) I canlook up and see what time the boo-boo happened and make a mental note. Not as cool as a marker (especially if you wanted to pass your audio to someone else), but it's a hack for the lack of marker. While I would almost always be using USB to power the unit, I think charging $40 for an AC power adapter (not included) is BS. If they didn't have the wingman app (which is very cool) trying to rename something would be a joke. I love that I downloaded the app, and it just connected. So the short answer of what would I change? – Not almost nothing. The price for the unit Pre-3 Unit is $699, the Pre-6 is $899, and the price of the adapter (AC) is $40. Someone who is going to be traveling alot, and wants to create great audio without having to worry (too much) about breaking the unit. The person wouldn't use the built-in microphones of a Zoom H5, and will always be traveling with a mic to record, and headphones to listen. Someone who has a small space, and they don't want their kids messing with a mixer. These units allow you to create presets, so you can fire up the unit press a button and everything is set. Also, it is super easy to plug stuff in. This looks fantastic, but the NZ $1235.23 price tag is way too much for us. I think we will be going with the Zoom H6, which can do pretty much the same job. Perhaps these will come down in price once these have been around a while?